The eradication of rabies in Limerick Ireland, with related stories. Rabies is an infection associated with a wide range of wild and domestic animals, after dogs, cattle were most commonly affected animals in Ireland in the late 1890s, having mostly been bitten by rabid dogs. Rabies virus is shed in saliva of infected animals and may be transmitted by animal bite or by a lick to an open wound. It may also be acquired from an infected human case as a result of injury related to their behaviour in the “furious” stage of the disease. The virus enters the peripheral nerves via muscle cells and travels to the central nervous system where it causes inflammation of the brain (encephalitis) and spinal cord (myelitis). The incubation period may last from two weeks to six months. Very often the primary wound is healed and forgotten by the time of clinical presentation. When the virus reaches the central nervous system the victim presents with headache, fever, irritability, restlessness and anxiety. This may progress to muscle pains, salivation and vomiting. After a few days to a week the patient may experience a stage of excitement and be wrecked with painful muscle spasms, triggered sometimes by swallowing of saliva or water. Hence they drool and learn to fear water (* Hydrophobia). The patients are also excessively sensitive to air blown on the face. The stage of excitement lasts only a few days before the patient lapses into coma and dies. In 1897 provisions were to be put in place under the Disease of Animals act to prevent the further spread of rabies throughout Ireland under this general order all dogs on public places required the muzzling, at the same time more stringent measures came into force as to the seizure, destruction and disposal of stray and unmuzzled dogs, also isolation was required for any animal suspected of exposure to rabies. These measures had an almost instant impact on the infection of animals in the country, as in 1895, 771 animals were reported as infected, 567 of these being dogs and in 1896, 687 animals of whom 491 dogs were reported infected. In the first six months of 1897 before provisions came into force on 1 July, there were 335 animals reported as infected, and only 162 reported cases in the second six months. The project was deemed a success as in 1898 the numbers infected had been reduced to 132 cases reported in total and it had reduced again in 1899 to only ninety-two cases. During 1898, the police seized 5,495 stray and unmuzzled dogs and 4,364 of these were destroyed. Over the last few years that rabies was prevalent in Ireland there were a number of human fatalities: in 1895 these included three males and two females, (one from Leinster, three from Munster and one from Ulster); in 1896 two males and two females (one from Munster, two from Connaught and one from Ulster); and in 1897, four males (two from Munster, one from Ulster and one from Connaught). In 1898 there were four died, the last recorded human fatalities in Ireland due to rabies. These statistics don’t get across the tragedy of individual cases. In December of 1894 Denis Moloney, a man in his seventies, lived alone in Cloughakeating between Ballinacurra and Patrickswell was standing in the boreen leading to his house when he spotted local stray terrier, he attempted to divert the dog away from his house but to no avail. The dog jumped at him and bit him on the left hand causing a flesh wound between his fore and index fingers. After a number of weeks his appetite gradually failed and he was taken to his bed but he still did not wish to avail of medical assistance instead called in the services of a local “charmer”. 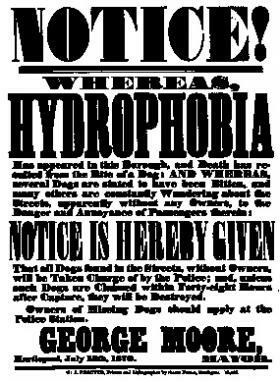 Finally Dr O’Brien, medical officer of Patrickswell dispensary, was called in and after treating the patient and learning of the incident with the terrier pronounced that the man had Hydrophobia (rabies) which he succumbed to a few days later on 25 March 1895. On 18 January 1896, Hanora Kenny a 60-year-old widow was in her house at Fish Lane, when a cat jumped at her. The cat, which had been infected with rabies, bit at the old woman’s arm. She pulled the cat off her by the scruff of its neck and held it while she screamed for help. Two men ran to her assistance and they proceeded to kill the cat and take the woman to Barrington’s hospital where she was treated for a mild form of the disease. Sadly she gradually became worse and died three months later. Although there was only one fatality due to rabies in Munster in 1896, the threat was ever present. It was not until 1902 that rabies was considered eradicated in Ireland. Newspapers: The Munster News 6 April 1895, Limerick Leader 10 April 1896, Limerick Leader 23 October 1896. Registrar General of Marriages, Births and Deaths in Ireland: thirty-first annual report, 1894. Registrar General of Marriages, Births and Deaths in Ireland annual report, years 1895-98 and 1912. Return under 50th Section of Diseases of Animals Act, 1894, as regards Ireland, years 1895-98. PreviousWho was Ada C. Rehan?